The Rancilio Rocky grinder weighs in at 8kgs (17lbs) and has a height off 40cm (15") which can be quite over powering in a small kitchen. The grinder is unusually quite due to a direct drive. While other grinders spin at a higher rate and use gears to convert down to a slower grinding speed, the Rocky is powerful enough to drive the grinder directly. When you switch the Rocky on there is just a humming noise. Of course, with beans in you get the usual grinding noise but overall it is quieter than other grinders. You have a choice between two similar models; one with a dosing unit and the other without. Ground beans lying in the dosing unit get stale after a while so the model with the dosing unit is recommended for when the grinder is used constantly. If you are only going to grind for one or two cups a day, the doser less grinder may serve you better. Personally I opted for the dosing unit as I get a nice coffee shop feeling from tapping the leveller and dropping the freshly ground coffee straight into the portafilter. Get a small brush to brush out old ground beans prior to each new grind to be a real coffee aficionado. Without the dosing unit, the ground coffee simply shoots out of the grinder and you'd better catch it with a suitable container (not your portafilter). The level of grinding can be set in a whopping 30 steps. This will produce ground coffee for a full range of coffee style: filter coffee, plunger, espressos full of crema and all the way to the thickest of ristrettos. The first thing you'll want to do with your new Rocky is to find out which level produces the best espresso shots in your set up. Start with level 15 and go down in steps of two. Remember that if you change the type of coffee beans, you may have to readjust the grinding level. Level 10 works best for me as it produces shots with a wonderful amount of crema. For stronger shots with less crema I go for level 8. Setting 10 is actually 14 steps above the point where the grinding surfaces touch each other. I am not sure whether -4 is a standard closest point with Rocky grinders but it is something to keep in mind when comparing settings with other Rocky owners online. There are some reports that oily beans, eg French roast, can occasionally get stuck in the grinder and have to be removed manually. Since I mainly use Brazilian coffee beans I have not experienced this myself. The price of (home) burr coffee grinders ranges from $10 to $500. The Rocky is around $300 and you really get what you pay for. It is our first grinder that is able to grind fine enough (and more!) for the Rancilio Sylvia espresso machine. I was told time and time again how a good quality burr grinder will improve the espresso shots produced by an espresso machine. I finally listened to the advice and can say that I am impressed with the improvement. My grinding adventure started a few years ago with the cheapest blade grinder on the market. I quickly discovered that a blade grinder does not really grind; instead it chops and slashes the coffee beans. The results are some very coarse and unevenly crushed beans which produce under brewed shots as the hot water is just rushing straight through the coffee. To get a finer grind the grinder has to be run for a longer period. This will generate a lot of heat from the tiny electric motor and this heat can burn the beans in the grinder. Not at all ideal. While a blade grinder may be enough for drip coffee where consistency is not critical it is not suitable of other types of coffee like plunger, espresso and "Turkish". Next step on the grinding ladder was a burr grinder. This type of grinder crushes the beans between a moving wheel and a non-moving part. A finer grind can be achieved my moving the wheel closer to the non-moving part. The grinder was fairly cheap and from a common high street shop (no names). It improved the espresso shots because the beans were now ground evenly but it was still not great because the grinder was not able to grind finely enough for the powerful Sylvia. The poor motor of the grinder burned out one fine Sunday morning after only one year of bi-daily usage. It was time to upgrade to a powerful and durable burr grinder. Let me tell you where to currently get the best espresso coffee in London: at the small Caffé Vergnano 1882 on 62 Charing Cross Road, London. I was lured in by a sign saying "voted best coffee shop in London 2005" but did not have any expectations. Yet another publicist trick I thought. The caffé is fairly small. Just a few tables and two bars along the window and the wall. When I visited there were three staff working and they were skilled and very efficient. First thing you notice when you enter the shop however is the massive Elektra Bell Epoque Q1-C espresso machine. On a note on the wall you find out that these machines are hand made and only a few (10?) are made each year. The Vergnano coffee company elects each year a European Vergnano coffee shop and lend them one of these "Rolls-Royces" of espresso machines. This is the first time ever a London shop has had the honour. I ordered a double macchiato which was brewed very well. Good temperature, excellent taste and no bitterness nor sourness. The barista even made a perfect rosetta on top of the coffee, effortlessly. Each coffee is served on a tray with accompanying glass of water. Do it right and have the water before the coffee to clean your palate. All the coffee machines, grinders, tables (and staff) are so clean and sparkling that you could almost make the mistake and think that the shop is closing or closed. This is however another sign of perfection and that coffee making is taken very seriously in here. The coffee experience was so good and such a surprise that I had to have a second double macchiato just to assure my self that it had been for real. Getting there: get off at Leicester Square tube station. Walk North along Charing cross road. The café is on the left side, just a few blocks up. Life is too short to be drinking bad coffee and having a decent espresso machina is half the story of good coffee. The other half being of course having good beans (and knowing the lingo). When my old Krups gave up it was time to upgrade to a big boy machina and the Rancilio Silvia had been very praised in the price class (affordable). Only one store was selling it in London so there I went. For £300 you expect a lot and Ms Silvia does not disappoint because of her heavy built, brass boiler and all stainless steel design. Rancilio is a renowned name in the industry and this is their only consumer model. The steam power is amazing and will froth your milk very quickly. The machina consists of several large parts that are easily taken apart for cleaning. The espresso making can be a bit tricky. It will take several runs to get any good at brewing good shots. There are several factors you will have to watch out for in order to succeed. The amount of coffee you are using, how well it is ground, how hard you pack it in the filter and what temperature you are brewing are just some. 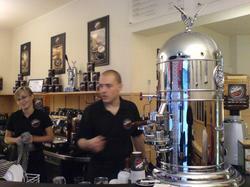 I have sampled many different coffees like Lavazza, Illy, Blue Mountain, Segafredo and various blends from local shops. While I like the different characters of many coffees I always keep coming back to Illy. Rich aroma, little bitterness and great crema make it a favourite. Americano: An espresso diluted with hot water. Espresso/Caffe Con Panna: Espresso topped by a dollop of whipped cream. Caffe Latte: An espresso made with steamed milk, topped by foamed milk. 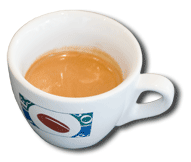 Espresso/Caffe Macchiatto: An espresso with a teaspoon or two of foamed milk. Caffe Mocha: A latte with chocolate. Espresso/Caffe Ristretto: A short, very intense shot. With the same amount of coffee as a full shot, half the water. Cappuccino: A shot of straight espresso with foamed milk ladled on top. Crema: The tan-coloured foam that forms on top of an espresso shot, as a result of the brewing process. Protects the espresso from being exposed to air. Espresso: The original one shot coffee brew. Hot water is pressed by means of a pump through ground, firmly packed coffee.